Traveling and need to know the plug, outlet, and power voltage of that country? We list the most traveled countries types of power outlets, sockets, and plugs from around the world. The voltage, plug, and socket chart with descriptions will give you the information you need to understand what type of travel power adapter you will need to bring. Knowing what type of outlet is in the country you will be traveling to is absolutely essential. You will need to be able to charge your phone, tablet, laptop, or any other mobile devices while you are traveling. Travel Hint: Bringing a universal travel power adapter with a compact power strip will solve all of your charging and power issues when traveling abroad. 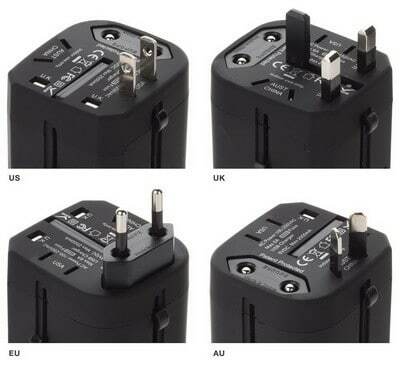 Universal travel power adapters have multiple plugs built into them for countries such as Australia, United Kingdom, New Zealand, Spain, France, Italy, EU, AU, UK, Germany, Mexico, Brazil, England, Ireland and more. A good universal travel power adapter will also have 1 or 2 USB connections/ports allowing you to charge your phone and tablet. You can then use the converted power outlet with a compact travel power strip allowing for many outlets to plug into. The voltage is 220V and the frequency is 50Hz. The voltage is 230V and the frequency is 50Hz. The voltage 127/220V and the frequency is 60Hz. The standard voltage is 230V and the frequency is 50Hz. The standard voltage is 120V and the frequency is 60Hz. Aruba and Bahamas standard 120V and frequency is 60Hz. The standard voltage is 220V and the frequency is 50Hz. The standard voltage is 100V and the frequency is 50/60Hz. The standard voltage is 220V and the frequency is 60Hz. The standard voltage is 240V and the frequency is 50Hz. The standard voltage is 127V and the frequency is 60Hz. In the United Kingdom (England, Scotland, Ireland) the standard voltage is 230V and the frequency is 50Hz. 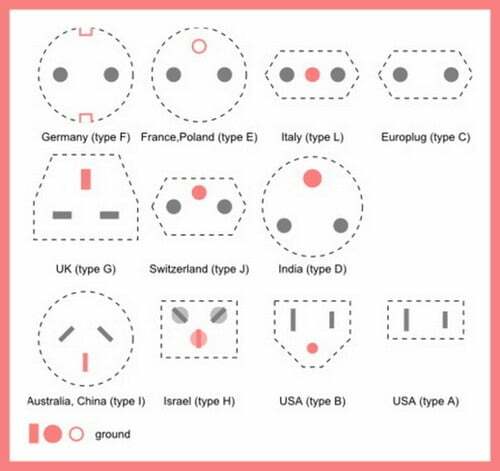 Are you traveling and need to know what type of outlet is in the country you are going to? Please leave a question below if you need information for a particular country and what plug, voltage, and outlets that country has.